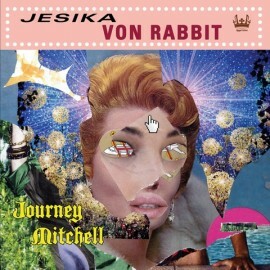 Journey Mitchellis the debut solo album by lead singer, keyboardist, and songwriter ofGRAM RABBIT,JESIKA von RABBIT. The album reflects a shift in energy for Jesika von Rabbitnow that Gram Rabbit are on a sabbatical of undetermined length. For her new project which was entirely written and recorded on her own, von Rabbit is extending the electronic element of Gram Rabbitwith “Adult Theme-Park Pop” - sizzeling celestial new-wave psych-disco with elements of dreamy, airy electronica. The first 500 copies of the LP comes on clear vinyl with a bonus track! Check out the video for "Psychic Spice"